Sunday: 9:00 a.m., *11:00 a.m.
Saturday: 4:00 p.m., *7:00 p.m. In the winter of 1848, Mr. I.E. Labrie, an influential citizen, went to Bourbonnais to explain to the parish priest there the needs of the 700 Aurora Catholics. After occasional visits by Father Louis A. Courjeault, Bishop James O. Van de Velde, the second bishop of Chicago, was persuaded, in September 1850, to come to Aurora to administer Confirmation. Returning in February 1851, Bishop Van de Velde bought nineteen and a half acres for a church which was soon built and dedicated to the Sacred Heart. Father Courjeault was succeeded in Bourbonnais by Father F. Lebel, who said Mass in Aurora once a month. In a short time, he became the first resident pastor at Aurora. The arrival of many Irish and German immigrants increased the size of the congregation, which had been predominately French Canadian. A severe windstorm, on December 24, 1852, did considerable damage to the church. The property was sold to the railroad and a new site was secured at the corner of Pine and Spruce Streets. Here the second Sacred Heart Church, was built by the pastor, Father Zuker. On the morning of November 8, 1869, a fire completely destroyed the second Sacred Heart Church. Father T.B. Murphy (1869-1877) and his congregation set about building a new church, this time in East Aurora. 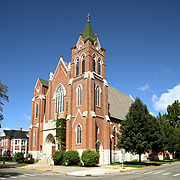 The new church was dedicated on July 7,1872. With the change in location came a change in name - St. Mary. Father P.A. McLaughlin (1894-1907) built the first parochial school in 1902, and obtained services of the Sisters of Providence from St.-Mary-of-the-Woods, Indiana. On October 8. 1972, St. Mary Parish celebrated its 100th anniversary and at the same time Father Edward J. Connolly (1964-1971), who retired as pastor of St. Mary Parish in September, 1971, celebrated his 50th anniversary in the priesthood. In 1975, under the pastorate of Father Richard W. Paddock (1971-1987), St. Mary School was renovated as a Parish Center and Area Center for Religious Education. In October of 1988, under the pastorate of Father Albert F. Rennell (1987-1994), the statue of Mary was moved in front of the parish center as a new shrine to the Blessed Mother. 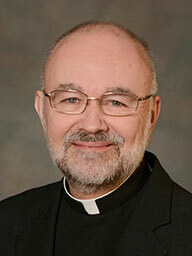 As of March 2007, Father Timothy R. Piasecki is pastor. 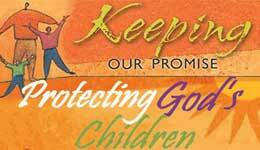 Approximately 400 families are currently registered at St. Mary Parish.